In honor of Miss Paisley Cornwall's birthday number 2 she gets 2 PEZ. Number 1 was sent to her in wrapping paper (with a load of PEZ candy to dispense). She can share about that if she wants to. Number 2 PEZ is a CLEAR CRYSTAL WITCH "C" - donated to the Cornwall PEZ Museum in Honor of Paisley's 2nd birthday. She also joins her CLEAR CRYSTAL cousins, the SLIMY, HAPPY & SPOOKY GHOSTS, SKULL "B" and PUMPKIN "C". ANY ONE FIND ANY NEW PEZ LATELY???? The other day Mom and Dad were walking through Toys-R-Us (looking for Halloween accessories) and Dad mentioned he was surprised that no one had found the new Mulan & Pocahontas PEZ as they should have been out for some time. 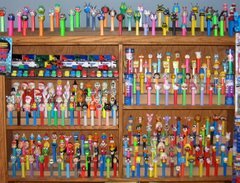 Mom suggested, "Why don't you look on that forum that told us where we could find the Easter PEZ last spring?" So today I logged in and this is the first entry that came up stating where this collector had finally found them. I posted it for a SWEET memory for all of us New England travelers last December. p.s. Many other entries said that these Disney Princesses had finally hit the Wal Mart in their town. None noted any much west of the Mississippi. In another forum chain dozens mentioned BEE MOVIE PEZ in Wal Mart all across the country. So Keep a look out. The new additions to the Cornwall PEZ Museum HALLOWEEN section are 1) MR. UGLY - This is part of an old Halloween set first issued in about 1970. 2) BLUE CRYSTAL PUMPKIN - This is a special limited release earlier this year (from CCC). They look good as part of our HALLOWEEN family don't they? Also joining the HALLOWEEN family is CLEAR CRYSTAL SKULL with jewel eyes. He joins his brothers - the SKULL; the GLOW-IN-THE-DARK SKULL and "DIABLO"/BLACK HEAD SKULL. Oh yeah, will these boys have fun on Halloween night! I have bid on this unique Mickey set recently. I haven't been too aggressive. They appear to be a NEW set to commemorate 80 years. They are probably from Europe and a few e-bay sellers are offering them quite regularly. I will keep you posted.